Multi-sport wrist top GPS device which provides comprehensive navigation and tracking functionality as well as trip information about various outdoor activities. An alternate spelling is GARMIN fēnix 2. Heart rate and running dynamics (cadence, ground contact time, vertical oscillation of your body), requires HRM-Run heart rate monitor with G-sensor, which is included in the pack but is also available as an option. 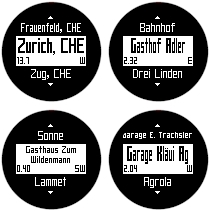 Note: The images below show the display of the fenix 2 in true resolution (70x70 pixels). 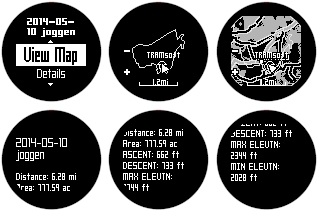 This does not necessarily mean that the display is shown it its true size (31x31 mm). The actual size of these images depends on the properties of your display. Many of the pages are configurable, the pictures shown are just examples. For the data fields, there is a choice of 148 different values, see selection. It is possible to unlock maps for the fenix 2 and transfer them to the watch. However, due to the small memory and display, they are only of limited practical use. Some values are only available for certain activities. 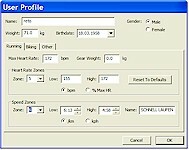 You can configure the device to show values in metric or english units. For each data field, you can choose one from the following 148 values. The values are grouped in 14 categories for faster lookup. 1 Timer AVG LAP Average Lap time for the current activity. 2 ELAPSED Elapsed time including the time when the stop watch was paused. 3 LAP TIME Stop watch time for the current lap. 4 LAP TOTAL Stop watch time for all completed lap. 5 LLAP TIME Last lap time: Stop watch time for the last completed lap. 6 MOV'N TIME Moving time: Running total of all time when moving since last reset. 7 STOP TIME Stopped time: Running total of all time when not moving since last reset. 8 STOPWATCH Stop watch time for the current activity. 9 TIME Duration of the current activity not including the time when the activity was paused. 10 TIMER Current time of the countdown timer. 11 Distance DISTANCE Distance travelled during the current activity. 12 LAP DIST Lap distance: Distance travelled during the current lap. 13 LLAP DIST Last lap distance: Distance travelled during the last completed lap. 14 ODOMETER Running total of all travelled distances. Does not get cleared when performing a reset. 15 TRACK DIST Track distance: Length of the current track. 16 Pace AVG PACE Average pace for the current activity. 17 LAP PACE Average pace for the current lap. 18 LLAP PACE Last lap pace: Average pace for the last completed lap. 20 Speed AVG SPEED Average speed for the current activity. 21 LAP SPEED Average speed for the current lap. 22 LLAP SPD Last lap speed: Average speed for the last completed lap. 23 MAX SPEED Maximum speed for the current activity. 24 MOV'N AVG Moving average: Average speed for the current activity not including stopped time. 26 VERT SPEED Current vertical speed. 27 Heart Rate A HR %MAX Average percentage of maximum heart rate for the current activity (requires heart rate monitor which is included in the pack but is also available as an option). 28 AVG HR Average heart rate for the current activity (requires heart rate monitor which is included in the pack but is also available as an option). 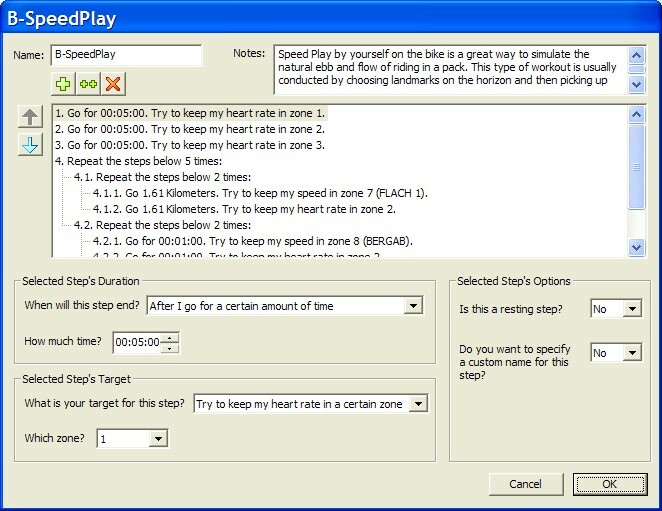 29 HEART RATE Current heart rate (heart beats per minute, bpm; requires heart rate monitor which is included in the pack but is also available as an option). 30 HR %MAX Percentage of maximum heart rate (requires heart rate monitor which is included in the pack but is also available as an option). 31 HR ZONE Current heart rate zone (1..5). 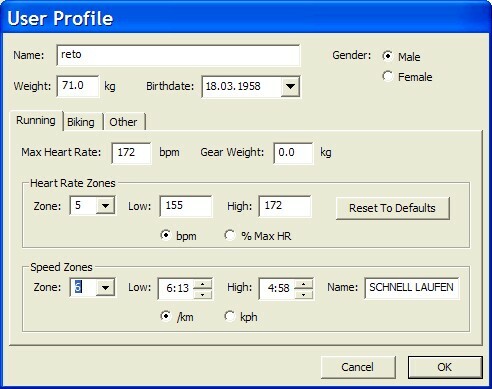 Default zones are based on the user profile, the maximum heart rate and the rest heart rate, but may be changed by the user (requires heart rate monitor which is included in the pack but is also available as an option). 32 L HR %MAX Average percentage of maximum heart rate for the current lap (requires heart rate monitor which is included in the pack but is also available as an option). 33 LAP HR Average heart rate for the current lap (requires heart rate monitor which is included in the pack but is also available as an option). 34 LLAP HR Average heart rate for the last completed lap (requires heart rate monitor which is included in the pack but is also available as an option). 35 TE Training Effect: Current impact on your aerobic fitness (1.0..5.0; requires heart rate monitor which is included in the pack but is also available as an option). 36 Run Dynamics AVG GCT Average Ground Contact Time: The average amount of time your foot spends on the ground in each step while running during the current activity, measured in milliseconds (requires HRM-Run heart rate monitor with G-sensor which is included in the pack but is also available as an option). 37 AVG V OSC Average Vertical Oscillation: The average vertical motion of your torso for each step during the current activity, measured in centimeters (requires HRM-Run heart rate monitor with G-sensor which is included in the pack but is also available as an option). 38 GCT Ground Contact Time: The amount of time your foot spends on the ground in each step while running, measured in milliseconds (requires HRM-Run heart rate monitor with G-sensor which is included in the pack but is also available as an option). 39 LAP GCT Lap Ground Contact Time: The average amount of time your foot spends on the ground in each step while running during the current lap, measured in milliseconds (requires HRM-Run heart rate monitor with G-sensor which is included in the pack but is also available as an option). 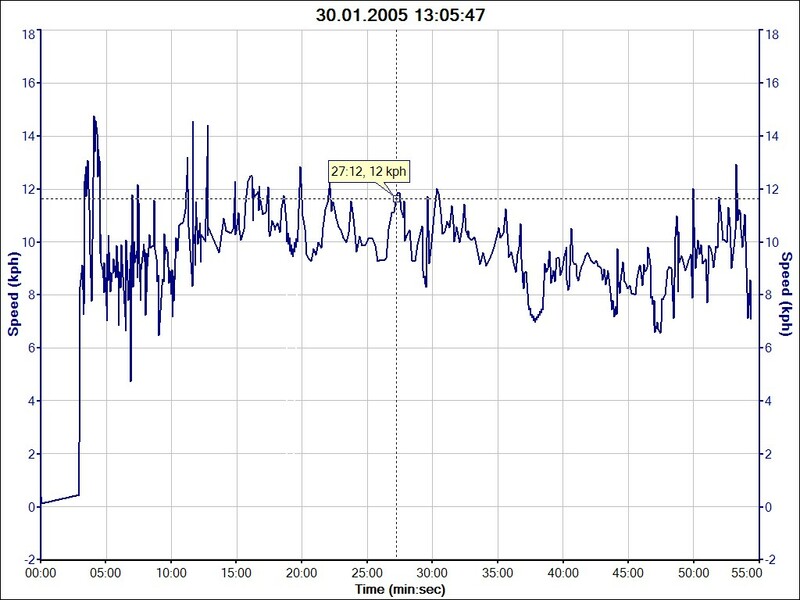 40 LAP V OSC Lap Vertical Oscillation: The average vertical motion of your torso for each step during the current lap, measured in centimeters (requires HRM-Run heart rate monitor with G-sensor which is included in the pack but is also available as an option). 41 V OSC Vertical Oscillation: The vertical motion of your torso while running, measured in centimeters (requires HRM-Run heart rate monitor with G-sensor which is included in the pack but is also available as an option). 42 Cadence AVG CAD Average cadence: Average number of steps or average number of revolutions of the crank arm during the current activity (requires HRM-Run heart rate monitor with G-sensor which is included in the pack but is also available as an option; the optional foot pod also provides this data). 43 CADENCE Number of steps per minute or number of revolutions of the crank arm per minute (requires HRM-Run heart rate monitor with G-sensor which is included in the pack but is also available as an option; the optional foot pod also provides this data). 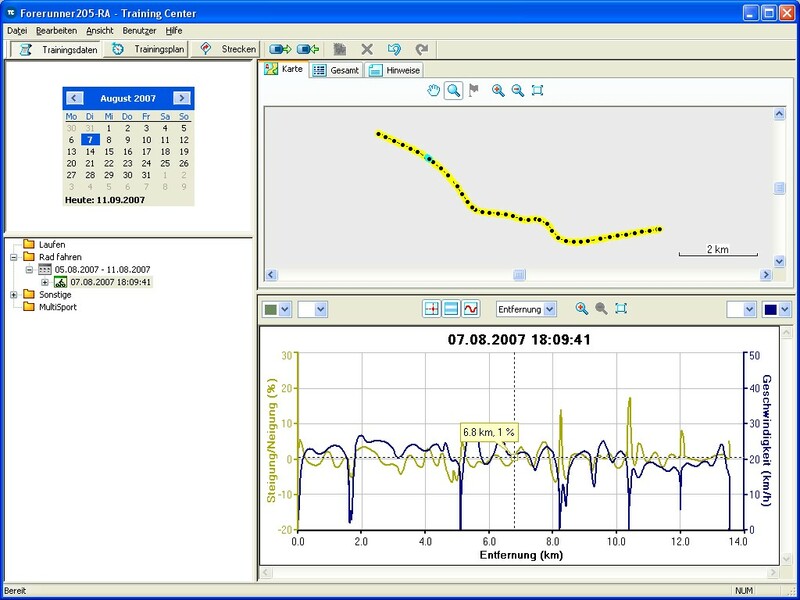 44 LAP CAD Lap cadence: Average number of steps or average number of revolutions of the crank arm during the current lap (requires HRM-Run heart rate monitor with G-sensor which is included in the pack but is also available as an option; the optional foot pod also provides this data). 45 LLAP CAD Last lap cadence: Average number of steps or average number of revolutions of the crank arm during the last completed lap (requires HRM-Run heart rate monitor with G-sensor which is included in the pack but is also available as an option; the optional foot pod also provides this data). 46 Altimeter AMB PRESS Ambient pressure: Uncalibrated air pressure. 47 ASCENT Running total of the elevation gain since last reset. 48 AVG ASCENT Average Ascent: Average elevation gain since last reset. 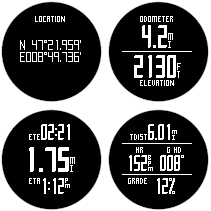 49 AVG DESCENT Average Descent: Average elevation loss since last reset. 50 BAROMETER Calibrated air pressure. 51 DESCENT Running total of the elevation loss since last reset. 53 GPS ELEVTN Current elevation based on GPS data. 54 LAP ASCNT Lap ascent: Elevation gain during the current lap. 55 LAP DESCNT Lap descent: Elevation loss during the current lap. 56 LLAP ASCNT Last lap ascent: Elevation gain during the last completed lap. 57 LLAP DECNT Last lap descent: Elevation loss during the last completed lap. 58 MAX ASCENT Maximum ascent: Maximum elevation gain since last reset. 59 MAX DESCNT Maximum descent: Maximum elevation loss since last reset. 60 MAX ELEVTN Maximum elevation since last reset. 61 MIN ELEVTN Minimum elevation since last reset. 62 Navigation BEARING Direction from a position to a destination measured to the nearest degree; also called an azimuth. 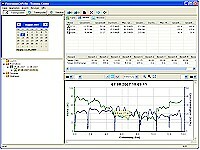 In a GPS receiver, bearing refers to the direction to a waypoint. 63 COURSE The direction from the beginning landmark of a course to its destination or the direction from a route waypoint to the next waypoint in the route segment. 64 FINAL DEST Final Destination: Name of the waypoint at the final destination of the current route. 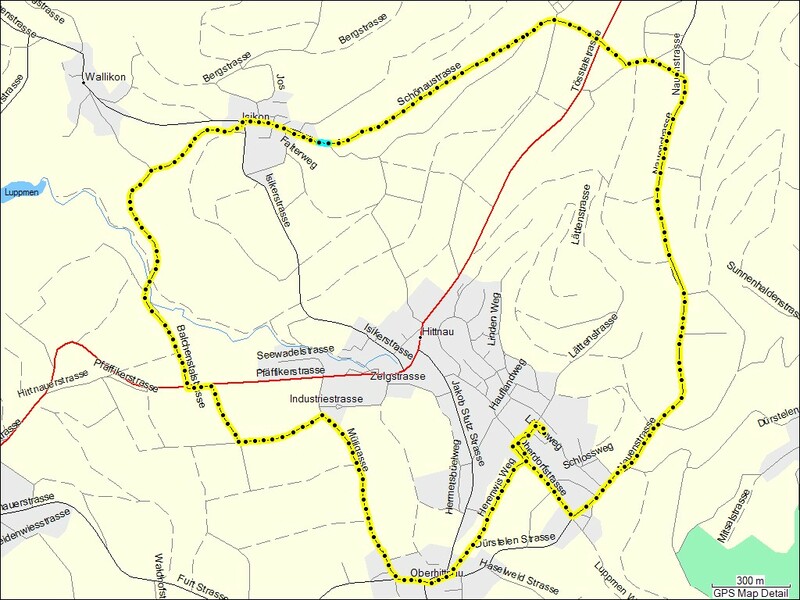 65 FINAL DIST Final Distance: Distance from the current location to the final destination of the current route. 66 FINAL ETA Final Estimated Time of Arrival: Estimated arrival time at the final destination of the current route. 67 FINAL ETE Final Estimated Time Enroute: Estimated travel time from the current location to the final destination of the current route. 68 FINAL VDST Final Vertical Distance: Elevation difference between the current location and the final destination of the current route. 69 FINAL VSPD Final Vertical Speed: Required elevation gain or loss to reach the final destination of the current route from the current location. 70 GR DEST Glide Ratio Destination: The glide ratio required to descend from your current position and elevation to the destination's elevation. 71 NEXT DEST Next Destination: Name of the next waypoint of the current route. 72 NEXT DIST Next Distance: Distance from the current location to the next waypoint of the current route. 73 NEXT ETA Next Estimated Time of Arrival: Estimated arrival time at the next waypoint of the current route. 74 NEXT ETE Next Estimated Time Enroute: Estimated travel time from the current location to the next waypoint of the current route. 75 NEXT VDST Next Vertical Distance: Elevation difference between the current location and the next waypoint of the current route. 76 OFF COURSE The distance you are off the desired route. 77 TO COURSE Direction to the planned route. 78 TURN Difference between the bearing to your destination and your current course. 79 VMG Velocity Made Good: The rate of closure to the destination, based upon your current speed and course. 11 Open Water Swim DISTANCE Distance travelled during the current activity. 80 Strokes AVG STRK Average distance travelled during one stroke. 81 INT STRK Number of strokes during the current interval. 82 STROKE RATE Average number of strokes per minute (spm) during the current activity. 83 INT STROKE RATE Average number of strokes per minute (spm) during the current interval. 84 STROKES Number of strokes during the current activity. 85 Pool Total CALORIES Calories burned during the current activity. 11 DISTANCE Distance travelled during the current activity. 86 LENGTHS Number of completed pool lengths during the current activity. 11 Interval DISTANCE Distance travelled during the current activity. 86 LENGTHS Number of completed pool lengths during the current interval. 87 REST REP The time remaining until the start of the next timed swim interval. 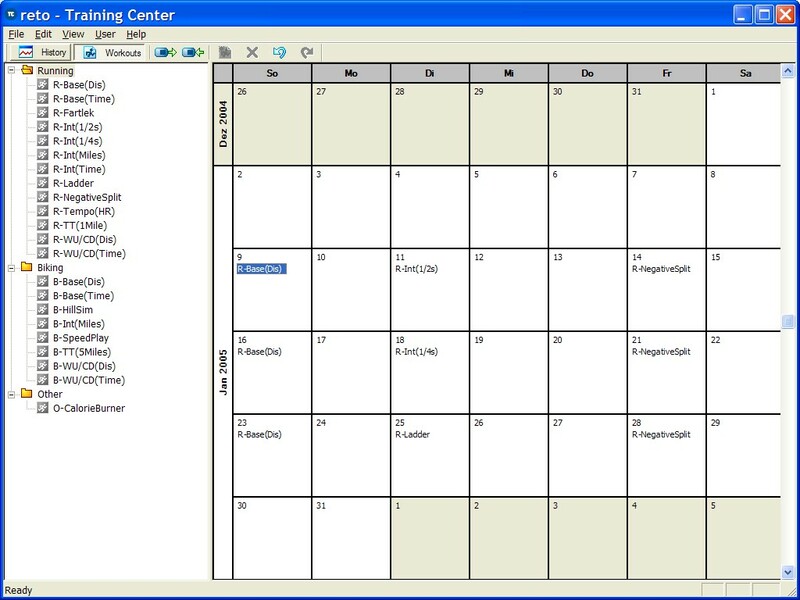 88 REST TIME Duration of the current rest break. 89 STROKE RATE Average number of strokes per minute (spm) during the current interval. 90 STROKE TYPE Detected stroke type based on the motion of your arm. 91 STROKES Number of strokes during the current interval. 92 SWOLF SWOLF score for the current interval. 9 TIME Duration of the current interval not including the time when the activity was paused. 94 Last Length PACE Average page during the last length. 95 STROKE RATE Average number of strokes per minute (spm) during the last length. 96 STROKE TYPE Detected stroke type based on the motion of your arm for the last length. 97 STROKES Number of strokes during the last length. 98 SWOLF SWOLF score for the last length. 99 Average PACE Average page during the current activity. 100 STROKE RATE Average number of strokes per minute (spm) for the current activity. 83 STROKES Number of strokes during the current activity. 84 SWOLF Average SWOLF score for the current activity. 101 Power %FTP Current power output in %FTP ("Functional Threshold Power") (requires optional 3rd party power meter). 102 AVG BAL Average Balance: Average contribution of the left and the right leg to the total power output during this activity in percent (requires optional 3rd party power meter). 103 AVG PWR Average Power output during this activity (requires optional 3rd party power meter). 104 BAL Balance: Contribution of the left and the right leg to the total power output in percent (requires optional 3rd party power meter). 105 BAL 10S Balance 10 Seconds: Average contribution of the left and the right leg to the total power output during the last 10 seconds in percent (requires optional 3rd party power meter). 106 BAL 30S Balance 30 Seconds: Average contribution of the left and the right leg to the total power output during the last 30 seconds in percent (requires optional 3rd party power meter). 107 BAL 3S Balance 3 Seconds: Average contribution of the left and the right leg to the total power output during the last 3 seconds in percent (requires optional 3rd party power meter). 108 IF Intensity Factor: The ratio of the Normalized Power (NP) to the functional threshold power (FTP), see TrainingPeaks for details (requires optional 3rd party power meter). 109 KILOJOULES Current power output in kilojoule (requires optional 3rd party power meter). 110 LAP BAL Lap Balance: Average contribution of the left and the right leg to the total power output during the current lap in percent (requires optional 3rd party power meter). 111 LAP NP Lap Normalized Power: An estimate of the power that one could have maintained for the same physiological "cost" if the power had been perfectly constant during the current lap, see TrainingPeaks for details (requires optional 3rd party power meter). 112 LAP PWR Lap Power: Average power output during the current lap (requires optional 3rd party power meter). 113 LLAP NP Last Lap Normalized Power: An estimate of the power that one could have maintained for the same physiological "cost" if the power had been perfectly constant during the last completed lap, see TrainingPeaks for details (requires optional 3rd party power meter). 114 LLAP PWR Last Lap Power: Average power output during the last completed lap (requires optional 3rd party power meter). 115 MAX LAP PWR Maximum Lap Power: Maximum power output achieved during the current lap (requires optional 3rd party power meter). 116 MAX PWR Maximum Power: Maximum power output achieved during the current activity (requires optional 3rd party power meter). 117 NP Normalized Power: An estimate of the power that one could have maintained for the same physiological "cost" if the power had been perfectly constant during the current workout, see TrainingPeaks for details (requires optional 3rd party power meter). 118 PDL SMOOTH Pedal Smoothness: Average torque in percent of the maximum torque of the cranks (requires optional 3rd party power meter). 119 POWER Current power output (requires optional 3rd party power meter). 120 PWR 10S Power 10 Seconds: Average power output during the last 10 seconds moving (requires optional 3rd party power meter). 121 PWR 30S Power 30 Seconds: Average power output during the last 30 seconds moving (requires optional 3rd party power meter). 122 PWR 3S Power 3 Seconds: Average power output during the last 3 seconds moving (requires optional 3rd party power meter). 123 PWR ZONE Current power zone (1..7). The zones are based on your FTP or user settings (requires optional 3rd party power meter). 124 TORQUE EFF Torque Effectiveness: Sum of clockwise pedaling power minus anti-clockwise drag (requires optional 3rd party power meter). 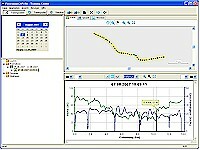 125 TSS Training Stress Score: A composite number that takes into account the duration and intensity of a workout to arrive at a single estimate of the overall training load and physiological stress created by that training session, see TrainingPeaks for details (requires optional 3rd party power meter). 126 WATTS/KG Power output in watts per kilogram of your body weight (requires optional 3rd party power meter). 127 Compass CMP HDNG Compass heading: Current heading based on the built-in electronic compass. 128 COMPASS Current heading = direction the device is pointing to based on the built-in electronic compass. 129 GPS HDNG GPS heading: Current heading based on the GPS data. 131 Other ACCURACY Current accuracy of the position determined by the GPS. 132 BATTERY Current charge level of the battery. 85 CALORIES Calories burned during the current activity. 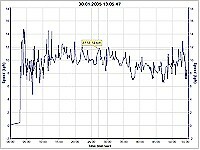 135 GPS Current strength of the satellites' signals. 136 GRADE Current grade computed from elevation change over distance. 137 LAPS Number of completed laps. 138 LAT/LON Current location as latitude/longitude coordinates. 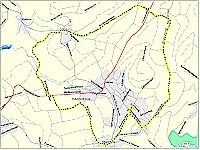 139 LOCATION Current location indicated in the selected format (datum). 140 MAX TEMP Maximum temperature recorded in the last 24 hours. 141 MIN TEMP Minimum temperature recorded in the last 24 hours. 144 STEPS Number of counted steps during the current activity. 145 SUNRISE Time of sunrise at the current position. 146 SUNSET Time of sunset at the current position. 147 TEMP Current ambient temperature. 148 TOD Current time of day. Data exchange: Supports archiving of data collected with the fenix 2. This model has been discontinued; however, you can still order options for the fenix 2. 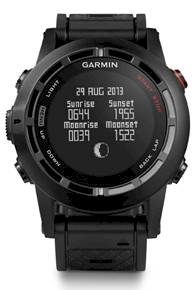 All options for the GARMIN fenix 2 in detail. Here we provide additional documentation and software updates related to the fenix 2.